This morning Kevin and Ruth came to visit. I invited them in to my apartment in order to show them the flowers on the balcony. Afterwards, we all went to DZ Akins Jewish Deli for breakfast. What a good time! You are looking great, George! That is wonderful! 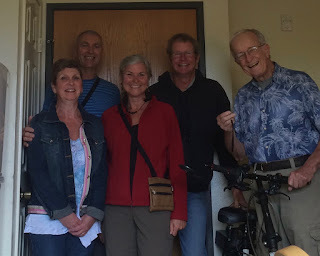 Great that you RVers can connect via Internet blogs. I've followed Kevin and Ruth travels for years. So nice that you connected there, everyone is looking wonderful , I am sure you had a great time! What an experience. Two sets of great boondockers together. Wish I would have been there. Love your flowers, you have done a wonderful job with them. It was great meeting up with you again today and catching up on all of your adventures! We would like to Pete, but I don't think time is going to allow for it. We're going up to O'Neill Regional Park next, and that's still 76 miles away from you guys. If we see ourselves with a spare few hours though, we'll consider doing the drive! George, you are looking well and how wonderful you can connect to long time friends/bloggers as they pass near your home. You do inspire loyalty among your friends and readers. Your looking good my friend. We miss you. When we get down your way I will contact you for a visit. We are back to full timing. In San Antonio at present heading to Branson MO. George, you are looking fantastic ! !